Trump's wiretapping claims: Spicer suggested we are seeing "more and more" evidence on the issue, adding that a "senior Obama administration official [Evelyn Farkas] talked about the spreading of classified information... and no one seems to care!" Nunes' surveillance claims: Spicer insists what happened with Rep. Devin Nunes was "both routine and proper," and reiterated they're worried about "the substance, unmasking and leaks." Spicer also confirmed that Rep. Adam Schiff will visit the WH later today to review the intelligence documents. Mike Flynn's request for immunity: Spicer said Trump wants Flynn to testify to Congress about Russia, saying he "wasn't offering legal advice" in his tweet. As for whether Trump is concerned Flynn will reveal damaging information about him, Spicer replied, "Nope." The failure of Trumpcare: "I would dispute that we signed onto someone's plan," said Spicer. "We worked with the House. We were very on-board." 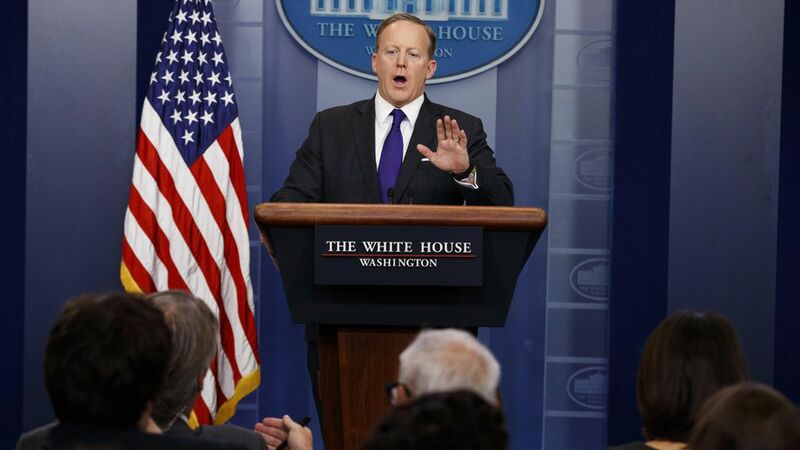 The Russia probe: The only evidence of any Trump-Russia connection is the Miss Universe pageant years ago, said Spicer, who added that Hillary Clinton's ties with Russia have not been questioned as much as Trump's. On backing off of Assad and Syria: Spicer said we have to accept the "reality" that Assad will stay, and blamed the Obama administration for missing the opportunity to oust him. Trump's tax returns: Spicer dodged questions on whether Trump will release his 2016 tax returns, but noted that the WH is "blessed" to have people who are giving up assets and are willing to undergo financial scrutiny. Trade executive orders: Spicer said Trump is calling for an investigation into "unfair trade practices," and said "this is the first time in modern history a president has ordered a review of reasons for the trade deficit." Sanctuary cities: When asked if cutting federal funding to sanctuary cities, such as in Chicago, hurts the police's attempts to curb violence, Spicer said, "You can't be a sanctuary city and… seem to pretend or express concern about law enforcement."